Inbox Testing consists of two separate components: Inbox Previews, which are actual screenshots of your mailing as it appears in the Inboxes of various email applications and mobile devices; and Spam Tests, which provide feedback about how your mailing is rated by common ISP and corporate spam filters. Inbox Previews and Spam Tests are both powered by Litmus, a leading provider of email testing and analytics. 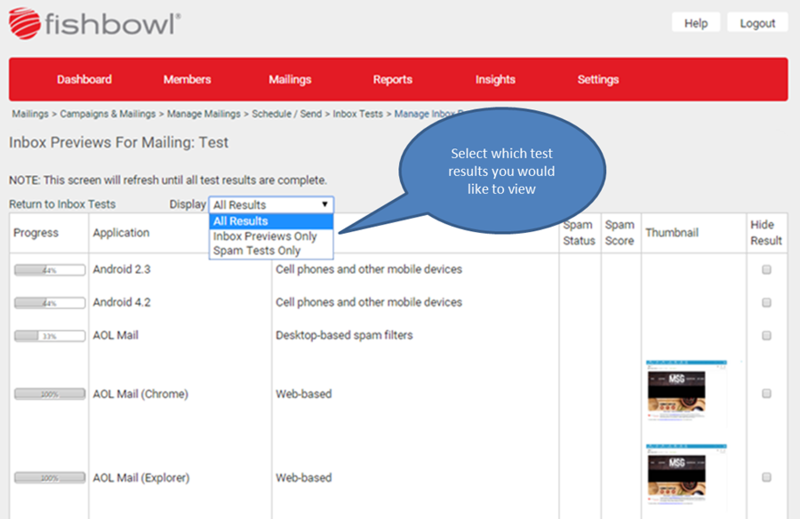 To create a new Inbox Test for your mailing, navigate to the Campaigns and Mailings screen, click the appropriate "Unsent" or "Triggered" link, click your mailing's Tests/Schedule/Send icon, then click the "Create/View Inbox Previews" link. The "Resolve for" drop-down lets you select the member for whom the mailing will be personalized. All Testers in the site will be included in the dropdown, and your own email address will appear at the top of the list if the email address associated with your Administrator record matches the email address of an existing member of the site. Click "Create Test" to start the test. If you've already reached the maximum number of tests your site has been allocated for the current month (see above), the "Create Test" option will not be available. Once the test has started, you'll be immediately redirected to the test results page. The test results page will automatically refresh every 60 seconds until all results (Inbox Previews and Spam Tests) are complete. Most results should be complete within 10 minutes or so, but some might take substantially longer. The Progress bar in the first column of the grid displays the estimated completion time of each result. The "Display" dropdown allows you to filter the results grid by type: All Tests (the default), Inbox Previews Only, or Spam Tests Only. Thumbnail images are available only for Inbox Previews. Click on the thumbnail image or on any Inbox Preview row to open a new window containing full-sized versions of all completed previews. The "Block Images" checkbox on that window allows you to preview how your mailing will look if images are blocked or hidden; not all email applications support this feature, however, in which case the "Block Images" checkbox will be disabled. The "Show Preview Pane" checkbox shows how your mailing will look when it's displayed in the email application's preview pane instead of in a separate window; not all email applications support this feature, either. The Spam Status, Spam Score, and Details columns of the grid apply only to Spam Tests. To learn more about Spam Test results, click here. To hide a specific result type, click the "Hide Result" checkbox: that result type will disappear from the grid and will remain hidden across all tests, not just the current test. To view result types you've previously hidden, click the "Show Hidden Results". To view all Inbox Tests for a specific Unsent or Triggered mailing, navigate as if you were creating a new Inbox Test (see above). To see Inbox Tests for all mailings in your site, select the "Inbox Previews" link from the Mailings tab in the menu. Click the View Results icon to view test results, as described above. Click the Edit Mailing icon to edit your mailing's content or settings. Click the Zipped Images icon to download a zip file containing a copy of all Inbox Previews images, including images representing the "Block Images" and "Show Preview Pane" versions of each preview that supports those options. Click the Message Source icon to view the raw (RFC-2822-formatted) version of your message. This page was last modified on 25 June 2015, at 09:49.